Conference Trip is scheduled for Wednesday, September 7, 2016, afternoon. Panorama sightseeing two-way boat trip from Bratislava Old Town to the Devín Castle, associated with the visit of the castle ruins and the stunning program performed by Journeymanship of Ancient Warrior Arts and Crafts in Bratislava that will bring you to the beautiful renaissance age. During the day, you can refresh yourself at the Moroccan tee house, visit historical stands, try archery or crossbow shooting. The entrance fee 8 € allows you also to visit the castle ruins. Visit of the Driny Cave and Červený Kameň Castle associated with wine tasting. The trip begins with a 35 minute guided tour in the famous Slovak cave Driny. Driny is a natural limestone cave located in the West Slovakia in the Little Carpathians Mountains. It is located about 2 km southwest of the village Smolenice. The cave's entrance altitude is 399 m and there is a 15-minute uphill walk from the parking lot. The first attempt to enter the cave was made by Prussian soldiers, who camped nearby during the Austro-Prussian War. It was finally explored in 1929, and the first 175-meter route was opened in 1934. The cave was declared a nature monument in 1968 and became a part of the newly designated Little Carpathians Protected Landscape Area in 1976. Today, of the total explored length of 636 m, 550 m are open to the public. During your 35 minute tour through the cave you will have a chance to explore beauties of this natural sight. The trip continues on the famous Červený Kameň (The Red Stone) Castle, which is just 25 minutes away from the cave Driny. The Red Stone Castle was specialized in the development of housing culture of the nobility and bourgeoisie in Slovakia. The 60 minute guided tour through the castle is focused on the contemporary furnished castle interiors. The visitors walk through parlors, bedrooms, dining room and a knight's hall, where the expositions of contemporary interior furnishings of nobility since the Renaissance period until the Secession period can be seen. The last stop on the way back to Bratislava will be one of the wineries of the well known Small Carpathian wine region. You will have an opportunity to taste some of the finest wines from the region along with some refreshments. Visit of famous castles on the Váh river and a beautiful town of Trenčín in the Western Slovakia. The trip will first take you to village of Beckov located in the Western Slovakia. The village is famous for its castle built on a steep high cliff above the Váh river (the longest river of Slovakia) and is a dominant feature on the horizon. The dominance of the rock and impression of invincibility it gives challenged our ancestors to make use of these assets. The result is a remarkable harmony between the natural setting and architecture. Beckov Castle is one of the oldest castles of the former Austro-Hungarian Empire. The first written records of the castle date back to 1208. In 1996 the ruins were reinforced and castle was open to the public. In the castle, you will have a chance to see the remains of rich Gothic and Renaissance decorations, stone water tanks, water well, Gothic staircase in the castle chapel and other interesting historical architectural elements. The castle also features a magnificent view of the slopes of the White and the Small Carpathians. If you would you like to try archery, you will have a chance at Beckov castle. The trip also includes the falconry show that will give you a remarkable experience and an immediate contact with the birds of prey inclusive a show of their flying skills. After leaving Beckov Castle our next stop will be the beautiful town Trenčín. The Trenčín castle is built on the top of a steep rock which dominates the town Trenčín and the region of Povaie. The history of the town goes back to the age of the Roman Empire, testified by the inscription on the rock about the victory of the 2nd Roman legion at Laugaricio (the Latin name of Trenčín) in 179 AD. The oldest building is a stone rotunda, plausibly founded in the Great Moravian period, when the castle served as a community center. In the next centuries it became the domicile of borderland commitat, royal and later aristocratic county. In the 13-14th century, the castle became the residence of Matthew III Csak, the legendary 'Lord of the river Váh and the Tatra Mountains'. The water well in the castle is associated with the legend of the Turkish prince Omar and his great love for beautiful Fatima, whom he had to redeem by digging a well in the rock. 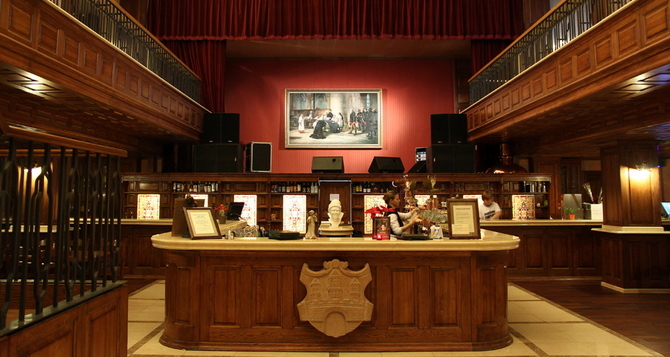 Today there are exhibition rooms and many museum expositions inside the castle. 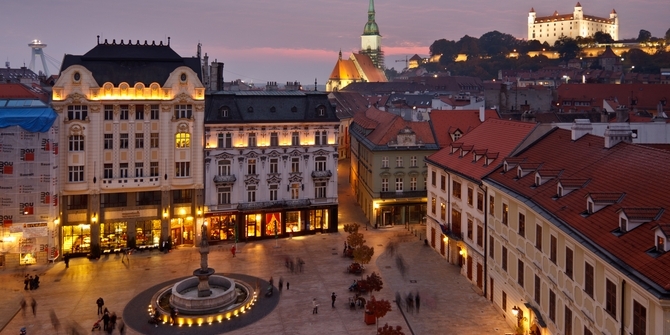 On a short guided tour you will explore the downtown of Trenčín. This walk in the historical center will take you to the Executor's House, City Hall, Jesuit Church and the Synagogue. You will have an option to individually visit the Trenčín Castle up on the hill or try some shopping in the downtown. After the short tour and some free time we will gather for dinner at the Retro Restaurant located directly below the medieval castle with the view to the Roman inscription. Plasma Medicine community teambuilding activity in Action Park in Čunovo. The Action Park is a unique place ready to host the 1st plasma medicine community teambuilding event. The goal of the action is to challenge teamwork, strengthen relationships, and improve communication to increase efficiency and productivity. The Action Park is situated in southern part of Bratislava, in town district called Cunovo. On the area of 28 000 m2 and capacity for 1000 visitors it provides 26 fun, adrenaline attractions and sports grounds. There are more than 110 of team activities. 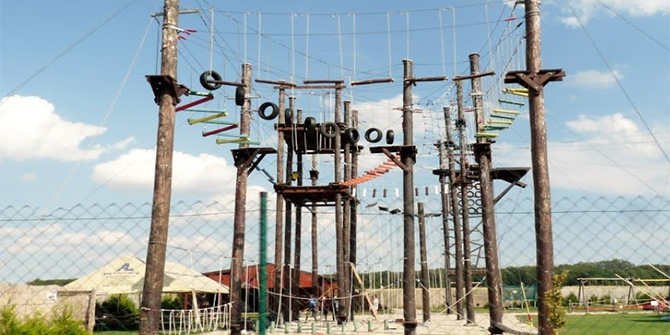 The facility includes various attractions, including rope center, paintball field, and a playground for extreme golf, bungee trampoline, zorbing hill, off-road track and many other activities. All support necessary complement party tents and shelters, buffet, changing rooms, swimming pool and others. This event is especially for people who are not afraid to try something bold. You will experience a half-day full of adrenaline and fun. You may experience a modern action sport called paintball, which not only requires speed and fitness but also tactical thinking. Action Park area offers the perfect space for sufficient antics when playing paintball in the form of SWAT military field with an area of 70x55m. Many trenches, shelters and obstacles will make you feel like being on a real battlefield. You can choose from a variety of games such as 'Central flag' (the team must try to carve out a flag from the middle of the field and transfer it to their own base) or 'Convoy' (teams must shoot their way through the whole course and use their bike to transfer to the destination point) or a little easier fight games that last until the last shooting player in a particular team. After paintball you may be challenged in the rope park with 15 obstacles at 8 meters above ground. The ropes are a combination of horizontal and vertical obstacles created by cables, pillars and devices with different difficulty levels. The brave souls who still look for a dose of adrenaline can experience a free fall on the giant swing. This attraction starts jumping from the 12 meter height and continues with 7-meter free fall and swinging for a few minutes. The best course finally comes in the form of an adrenaline 120 meters long rope lift. You will enjoy the feeling of freedom and experience a speed up to 40 km/h. All you need is courage and a relatively good physical shape. Complimentary drinks and light refreshments on site. Remarkable trip on the tour vehicle through the oldest streets of the city centre. 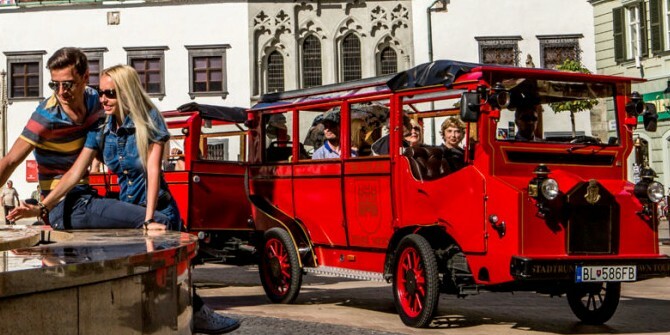 This tour on the Presporacik-Oldtimer tour vehicle will take you to all the must-sees of the capital. Unique tour vehicle is the only tour vehicle that takes you directly through the oldest streets of the city centre, called the Old Town, to the courtyard of the medieval Castle with a beautiful view of the entire city and its surroundings. From your comfortable seat in the tour vehicle, you will see the legends and most fascinating sites, such as the Grassalkovich/Presidential Palace, Old Town Hall, the Executioner's house; Venturska Street - center of the rich musical life of the city; the beautiful Slovak National Theatre or Slovak Philharmony. After the 60 minutes of tour vehicle tour, with a professional commentary in English language, you will take a 2 hours walk in the pedestrian zone of the Old Town. You can follow your guide and take photos of the tourist's most popular sites: Roland Fountain - the oldest fountain in the city; St. Martin's Cathedral, the coronation Cathedral of Hungarian Kings; ancient St. Clare's Church; St. Michael's Gate - the last remaining well-preserved town gate; palaces from the time of Empress Maria Theresa; the Plague Pillar, galleries, museums, churches, etc. During your walking tour you will have a chance to have a look inside of a Primate's Palace - a neoclassical palace in the Old Town of the capital. In 1805, the Palace's Hall of Mirrors saw the signing of the fourth Peace of Pressburg (Bratislava), ending the War of the Third Coalition. Today, it serves as the seat of Mayor of Bratislava and it is very special to see it from inside. That is why you cannot miss this trip. It is said that who has never been in Flagship restaurant - does not know Bratislava! You have a great opportunity to finish this amazing afternoon with having a meal in Bratislava Restaurant Flagship. There is a wide choice of Slovak national specialties and a great atmosphere.